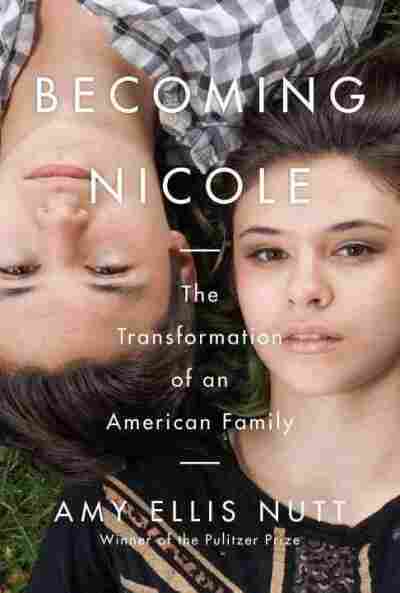 'Becoming Nicole' Recounts One Family's Acceptance Of A Transgender Child : Shots - Health News When Kelly and Wayne Maines adopted identical twin boys in 1997, they didn't anticipate raising one of their sons as a daughter. They tell their story, with author Amy Ellis Nutt, in Becoming Nicole. 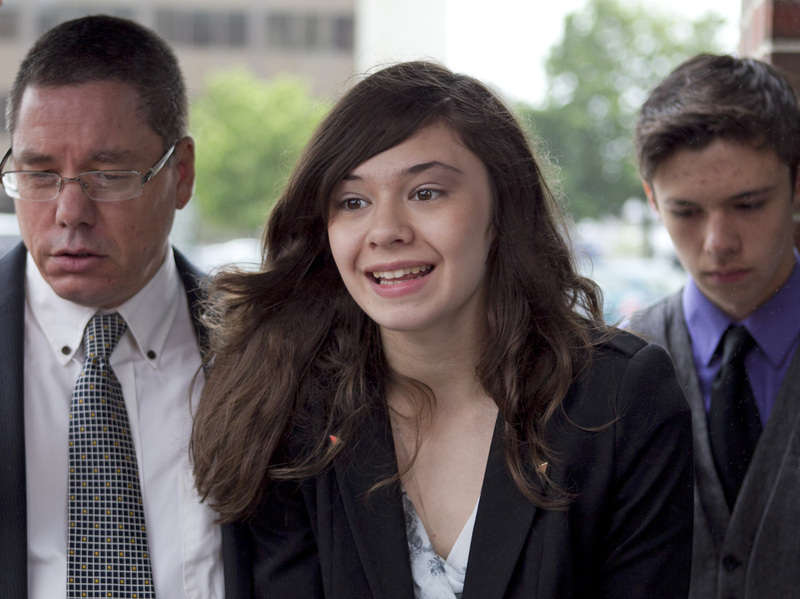 Transgender student Nicole Maines (accompanied by her father, Wayne, and her twin brother, Jonas) speaks to reporters after winning on appeal a discrimination lawsuit against her school district. In 2014, Glamour magazine named Maines one of its 50 inspiring women of the year. When Wayne and Kelly Maines adopted identical twin boys, Jonas and Wyatt, at birth in 1997, they were thrilled at the idea of having two sons. For a while, it was virtually impossible to tell the boys apart. But as they grew older, one child, Wyatt, started insisting that he was a girl. "I [was] like, 'Hmm, I've got twins but one's not like the other. They're very different,' " Kelly Maines, the twins' mother, tells Fresh Air's Terry Gross. "I spent a lot of time trying to figure out what was going on: ... Is she gay? Is she transvestite? Is she transgender? I honestly had no experience in understanding what any of that meant." Over the course of several years, Kelly and Wayne began to accept that one of the twins was transgender. They had Wyatt's name changed to Nicole and began buying her dolls and girls' clothes, which she had been asking for. Wayne acknowledges that it wasn't always easy. He worried about what the neighbors would think, but those concerns faded when Nicole began being bullied and harassed. "When people start coming after your kid, you get your head right: 'This is my baby. Don't mess with my kids.' That's probably when I turned a corner," he says. The Maineses went on to file a discrimination lawsuit against Nicole's school district, which they won on appeal last year. This year, Nicole and her twin brother, Jonas, graduated from high school and Nicole had gender reassignment surgery. Together with Pulitzer Prize-winning journalist Amy Ellis Nutt, Wayne and Kelly Maines tell their family's story in a new book, Becoming Nicole. Nutt joined Kelly and Wayne Maines in the studio to discuss the book and how biology affects gender identity. Wayne Maines: I tried to influence it in other ways, you know, you meet Nicole, even at that age, [she had an] extremely strong personality. If I would say to her, "You don't want to be a girl," she'd say, "Yes I do." I'm a 40-year-old guy having this debate with this little kid and I'm losing, you know? It was hard. ... You have this vision of what you think the American dream is and your family, and it's not what it is. I've learned more from my two children and Kelly than I ever thought possible. I learned that everybody needs to be who they need to be, and I learned that people, little children, know who they are at that age. I would be in those aisles in Target with girls' clothes like, "I wish I could get this for her, for Wyatt. I know Wyatt would love this. I can't. I can't." Or sometimes I would [buy the girls' clothes] and it would be like, "These are your home clothes. These are your school clothes." It just got so much better when we finally said, "Enough. You can like it or leave it: This kid is who they are." For a parent, too, when you do finally make that turn, the biggest fears are she's gonna get hurt. Somebody's not gonna like it. And when we ended up having our problems the anger [of others toward Nicole] was the thing that was so shocking. Nutt: I think the most important thing is that it changes the view of gender identity, or of an anomalous gender identity, as being somehow abnormal. It's not a disorder. The problem for kids, for transgender people, isn't within, it's without. In other words, their trouble with their gender identity comes essentially because others view them one way when they view themselves another. Nicole, for instance, even as Wyatt, always described herself as a "boy-girl," or a "girl-boy." She was completely confident in who she was. She knew that she was a girl, but she also knew that people referred to her as a boy and that she had a boy anatomy. So this was a child who was never unsure of who she was, but she knew there was a problem with how other people and the rest of the world viewed her. And that's where the dysphoria comes in — when there's a mismatch between what we expect and what, perhaps, the sexual anatomy says, and what the brain is telling us. Nutt: In the first six weeks our gender anatomy, our sexual anatomy, is set. Essentially we all begin in life asexual and then certain genes and hormones kick in, and our sexual anatomy is determined to either have male genitalia and male reproductive organs, or female. However, scientists are learning that while that happens at six weeks, it's not until six months that the brain masculinizes or feminizes. That is, that the hormones in the brain determine is this the brain of a girl or is this the brain of a boy? Sexual orientation, they're also discovering, is a third process, but what they're really focusing on is trying to understand that they're not all congruent. Normally, prenatally we develop along the same lines, that our sexual anatomy matches up with our gender identity, but what they've discovered is that there's a space in between. There are weeks in between in prenatal development when many things can happen. We know that many things can influence the environment of the womb, and the environment of the womb influences the level of hormones and the chemicals that go into the development of a fetus. And so there are many things that can happen between the time that a fetus' sexual identity is set and their gender identity is set. Nutt: Identical twins obviously have the exact same DNA. What they don't have is the exact same epigenome, which means not all of the genetic switches are turned off and on in identical ways. ... The explanation for that, scientists give, is that in the womb identical twins have separate amniotic sac[s] and umbilical cord[s] and therefore they get various and different amounts of hormones and nourishment. And they've discovered that even your placement in the womb — where you are located in the womb — for identical twins can affect the ratio of hormones and nutrients that you get, and, therefore, it is a different environment. The environment affects who we are, our gender identity, and the environment of the womb, even the top of the womb, the lower part of the womb, can affect how the brain is set, even in identical twins. Nutt: Gender isn't something that's necessarily fixed, that it's dynamic, that it's fluid. ... There are very few people that are 100 percent totally masculine or 100 percent totally feminine. We have traits of both, and so, ordinarily, it's something in between. I think, people are feeling more comfortable now saying, "Yeah, I've never felt 100 percent masculine, but I'm mostly masculine." And, I think, it has become a more comfortable society to say that in. But I think it's also because the science is now supporting that.